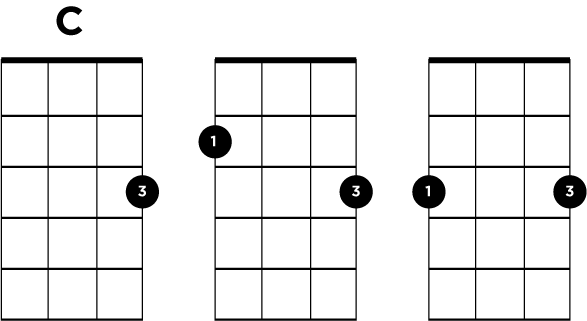 In the previous lesson I looked at ways to add a little something to simple chords, to bring a bit of variety to songs which might only have a handful of chords in them. Instead of playing bar after bar of the same chord, I suggested some easy ways to change chords by one note to give them some colour. One place where it really works is in a 12 bar blues. It is a structure which turns up again and again, in hundreds of songs, and by its definition, involves a lot of the same chords over and over – perfect for spicing up! …and in the video I play it through plain and simple, using the chords A = 2100, D7 = 2020, and E7 = 1202. Now let’s look at each of those chords and see what we can do to them. All of the ideas below are included in the video if you want to see & hear them in action. If you are playing A (2100) with your index and middle fingers, your ring finger is probably already hovering over the open E string, so let’s put it to use. As you strum A again and again, drop your ring finger down onto the E string at the 2nd fret, and then lift it straight off. You might already know the chord which appears for a fraction of a second as F#m (2120) but just like the previous lesson, we are not going to worry about the theory – just hear the way it sounds. For a third variation, you can just switch from A (2100) to A7 (0100) – that can sound good immediately before you change to the D7. Speaking of D7, what can we do to give that some colour? Once again, when you are playing 2020, your spare finger can come into play, this time on the A string, 2nd fret (2022). Drop it down and then straight off. Then you can repeat the slide up to 3rd fret (2023) and back down to 2nd. 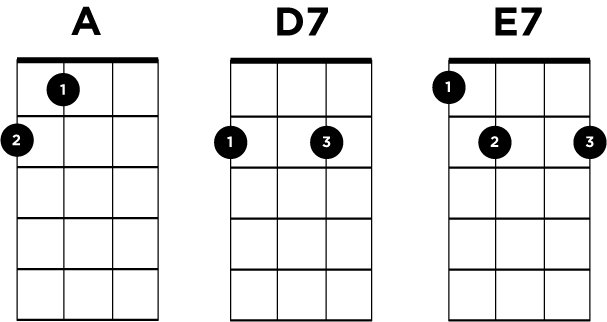 Changing E7 is a bit of a stretch, but while you are playing 1202, there is just your little finger left – try to reach the 4th fret on the A string. You just need to touch it down for a fraction and then off again. And if you can’t reach, no matter – E7 isn’t there for very long anyway! So that gives you ways to play around with all of the chords in a 12 bar blues in A. The thing to remember is not to do all of the variations all of the time. If you do that, they stop being variations, and become the norm again. Keep mixing it up, keep it interesting. 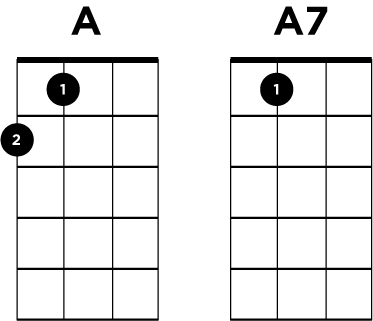 Now let’s try something similar in a different key – let’s look at a 12 bar blues in C. That’s the same chord sequence as above, but with C,F,G instead of A,D,E. 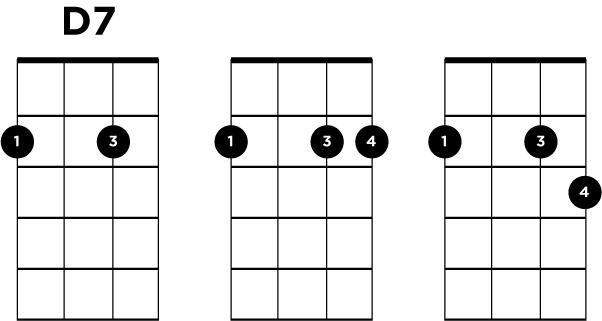 The previous lesson had some variations on C, but for a 12 bar blues there is another which works well, similar to the way we changed the A chord. As you are strumming C (0003), drop your index finger down onto the G string, 2nd fret (2003) so you are playing a mixture of C and Am. And you can slide it up from there to the 3rd fret (3003) and back down again. Or if your middle finger is doing nothing, you can use that on the 3rd fret, rather than sliding the index finger up. 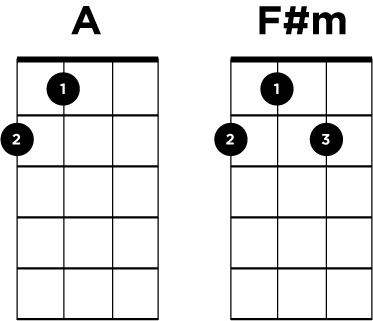 Moving on to the F chord, if you play F7 (2313) then you will struggle to find a spare finger to drop onto a string. 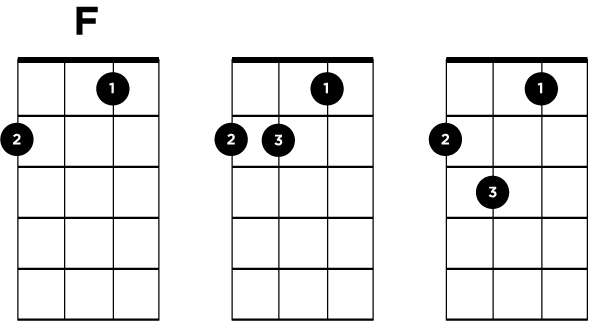 I have found there is more scope for varying things if you start with F (2010) and then use your ring finger on the C string, 2nd & 3rd frets again (2210 & 2310), much the same as it did for the A & D7 chords above. The G7 (0212) can be changed by quickly lifting your finger off the E string (0202) and back down. Or leave that finger where it is and take the other two off (0010). Or play around the A string, taking your finger off (0210) or adding your little finger to the 3rd fret (0213), and lifting it back off. So many options! So we have found a number of ways to change things around in a 12 bar blues. As always, give it a try, start slowly, practice a bit, and see if it fits into things you already play. But most of all, enjoy it! 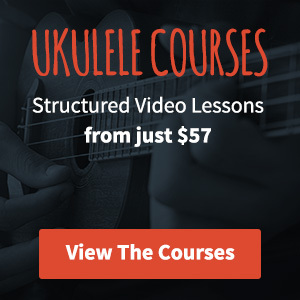 If you really like playing the blues on ukulele, I’d highly recommend taking a look at Al Wood’s How To Play Blues Ukulele ebook and the Blues Mini Course from Uke Like The Pros. Both will really level up your blues skills. is there a book available with walk downs (licks, runs?) just to add a little interest to simple songs. Hey Carol, if you’re specifically talking Blues then Al Wood’s How To Play Blues Ukulele (check my review here) is the best I’ve seen. If you’re looking for something more general, there isn’t anything I know off the top of my head. I’ll have a think though. I would also give Al Wood’s e-book a vote. Another one I have picked up a few things from is Dave Rubin’s book “Blues Ukulele”, published by Hal Leonard. Like the Al Wood one, it comes with loads of mp3 files, always good if, like me, you can’t pick things up just by looking at dots.